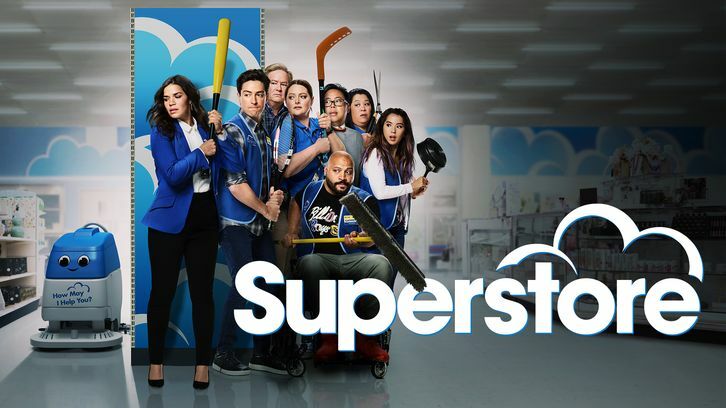 Superstore - New Initiative - Review: "Meet the Parents"
Attention Cloud 9 shoppers: Now that Thanksgiving and Black Friday are over, we're now in a momentary state of normalcy before the holiday shopping really kicks into high gear. In anticipation of that, we have gotten our reviews back in stock just in time for a new outing in the store tonight! This episode's shenanigans begin with Glenn introducing the store's new initiative, "Service with a Smaisle." Though, of course, Glenn didn't understand the wordplay and pronounced it so that it rhymed with Mrs. Maisel. This initiative basically just means connecting with the customers on a personal level to help draw customers away from Amazon. The fun starts right away when Amy and Mateo play rock, paper scissors to determine who will have to approach a nearby couple. Mateo loses, but uses his approach to direct them to Amy, which she is just thrilled about. They almost immediately begin talking about their son in medical school and Amy straps herself in for a terrible day spent listening to these two. But things perk up for her when they run into Jonah, the son they're visiting who is in medical school. Jonah explains to Amy that he was under pressure from his parents and told a lie once that ended up turning into a long-running deception and now they think he's a med student. Amy agrees to keep his secret, but she absolutely goes back to his parents to hear some embarrassing childhood stories about Jonah. 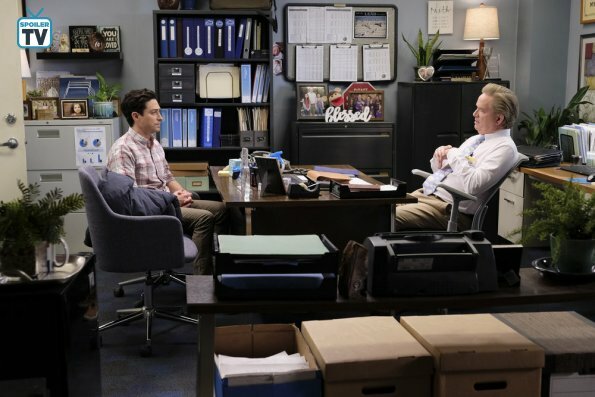 Soon after, Glenn approaches them and begins to ask Jonah to do some tasks around the store. Amy tries to stop him by volunteering herself, but it starts looking hopeless as Glenn begins introducing himself to Jonah's parents. Out of options, Amy calls Glenn's name and chucks a yam at his face to shut him up. The three of them have a private chat and Glenn agrees to let Jonah clock out early so he can leave with his parents and continue the ruse. It seems like everything might end smoothly, but as he's getting his stuff to leave and explaining to the rest of the staff he'll never have to tell them he works here, he says the whole situation is temporary, which Amy takes to mean her as well. I screamed internally a bit out of fear for their relationship. Jonah attempts to rebound without revealing his secret relationship with Amy to everyone, but she quickly leaves to change the rat traps. Meanwhile in the store, Dina and Garrett engage in a smile-off to determine who can hold a smile the longest. This understandably leads to awkward moments. A man trying to return some jewelry he had engraved for the wife who's now divorcing him didn't take so kindly to seeing Garrett's smiling face through the whole exchange, and things likely also got a bit rocky with the next customer who was trying to return a pet collar. And not because it grew out of the collar. Later, Sandra approaches Dina to tell her she left the Sudafed unlocked and it got stolen. Dina's attempts to yell at Sandra for the incident fail, though, as she has a smile plastered to her face and Sandra takes the entire exchange as a joke. Desperate to win, Dina sends an ex-girlfriend of Garrett's over to him to tell him he's the father of her child and make him drop the smile, but Garrett notices Dina lurking in an aisle and quickly figures it out. The two then sit across from each other in the break room and say insulting, hurtful things back and forth to try to and get the other to break. Unfortunately, we never get to see who wins as the last we see of them is Garrett questioning why they're doing this to each other. I have to assume it ended in a draw. I thought "Delivery Day" would end up being the top episode of the season, but "New Initiative" came around to prove me wrong. I laughed every minute of this episode, and more than just a simple chuckle. Mateo had some absolutely stellar moments this episode. Saying "Eww" to the customer asking if he knew about drills, pretending to be straight, and snacking while watching Jonah's parents have a meltdown in the store were all highlights of the episode. I had also seen zero promotional material for this episode before watching it, so finding out this random couple in the store were Jonah's parents caught me pleasantly off-guard. They also passed up huge opportunities to cause problems for Jonah and Amy, like her brief disappointment in hearing Jonah say everything was temporary for him, or when his parents mentioned his "fiancé ". Now that they're public, my money is on a proposal by the end of the season with a wedding for next year's finale. Now that Amy and Jonah are really in this, the only thing that will take down this show (other than the writers suddenly becoming terrible) is breaking them up. Not that I'd stop watching, but I wouldn't be happy about it! Side note: Glenn gets the MVP award for taking a yam to the face and agreeing with Amy that it was their only option. This award almost went to a trio of shoppers I dubbed the Amazon Hype Squad, simply because they all worked together to shamelessly plug Amazon Prime, and I always think that blatant product placement is hilarious, whether it's intended to be or not. Like, they didn't even care about hiding it here. I'm honestly surprised nobody looked directly into the camera and said that nothing will ever be better than Amazon Prime. But, alas, the coveted title will go to none other than the Obvious Murderer! Glenn approaches this man to try out the new initiative and is shocked to discover his cart if full of a troubling combination of items. A tarp, rope, duct tape, a shovel. He's also looking for bleach. Glenn tells him they're out of bleach so he has no part in this, but caves when the man says he'll just order the bleach from Amazon. It's better to be partially responsible for a potential murder than to lose a sale to Amazon! Sure, this could all be innocent stuff he needs for things that aren't catching up with his mom on Thanksgiving, but we also see him in the store later testing out kitchen knives by practicing his stabbing motion. So, due to the entertainment value and minor fear for my life, Shopper of the Week rightfully belongs to Obvious Murderer (please don't hurt me). What was your favorite part of the episode? Are you happy Jonah and Amy are finally public? Is that guy REALLY going to kill his mother? Sound off in the comments below!